Take the first step in your organization’s talent journey by completing our talent survey. 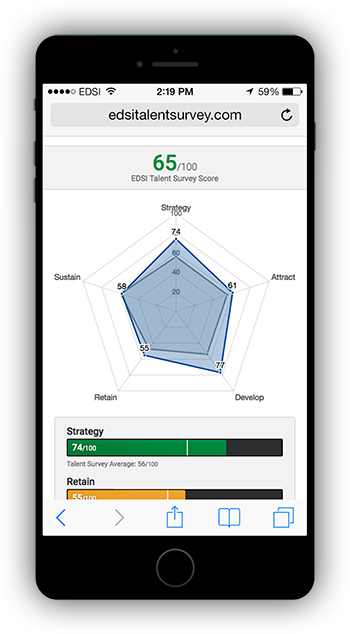 EDSI's talent solutions consulting team specializes in providing organizations with support in 3 critical areas: Attracting, Training, and Retaining talent. Our unique approach empowers organizations to develop and implement "better, faster, smarter" people strategies, positioning companies to align key business goals with talent initiatives. Ultimately, we provide our clients with the data, insights and tools necessary for employees and businesses to thrive in an ever-changing and competitive job market. Whether you find yourself in the midst of a talent crisis or you are looking for perspective on how to continuously improve your successful organization, our experts will guide you on your talent journey.